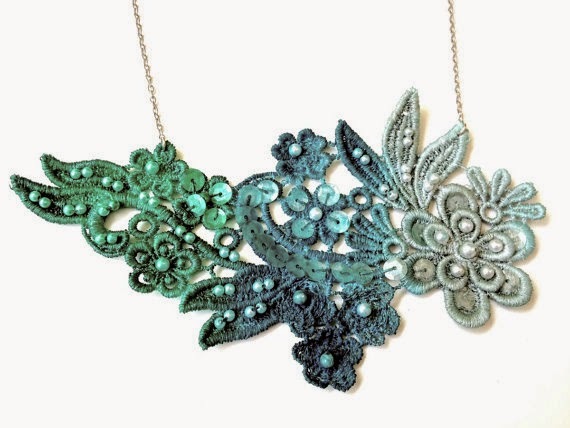 Lace-jewelry pioneer Lindsay Bleier of White Bear Accessories began her love-affair with the craft at the young age of ten. Her creativity was fostered by her mother, the owner of a clothing and accessories company, who sagely encouraged her and her sister to put their creative energy into art. Lindsay soon found herself surrounded on all sides by her growing treasury of jewelry creations, and friends suggested that she sell her unique pieces online. She founded her e-shop, White Bear Accessories, and with time, her designs evolved and her signature lace jewelry was born. The idea to combine lace and jewelry came to her naturally. A girly-girl through and through, Lindsay’s admiration for all things sweet, romantic, and vintage guide her design style. She takes cues from her favorite historic costumes, referencing the lace and glamour rocked by English royalty in her hand painted rings, necklaces, bracelets, and hair pins. The young designer can be found in her Miami-based studio, listening to the Beatles, quipped with a paintbrush and paint in every shade set before her. Color is perhaps the most striking aspect of her jewelry line, with eye-catching crimsons, tones of emerald, neons, and ombre in all shades. Since each piece is handmade, Lindsay is able to customize her creations for her clients, a rare find in these days of mass-produced fashion. Lindsay claims that the right necklace is more than just jewelry, it’s a statement. ”I want my customers to feel empowered, strong, daring.” With jewelry backed by that kind of passion and love, it’s not so farfetched a hope.